We replaced for rust for many years. Indeed new is good. I think it is strong against rust because it is stainless steel. So it may not be replaced in the future. I wish I had a little more cospa. This review is about item#36807994. 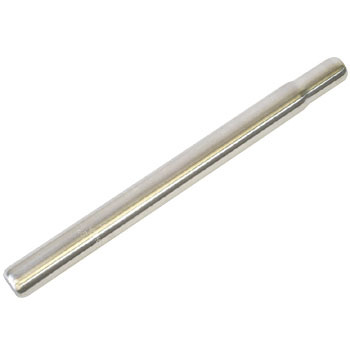 It is an ordinary product of stainless steel roll. Because it can be used for general purposes, it seems to be widely used for bicycles where rust is anxious. This quality at this price. It was out of stock for a while, but it was good. We also want products that are 5 cm long. I got a bicycle from an acquaintance, but since it is a 26 inch low floor frame, even if I raise it to the seat post limit line full, the saddle height is low, so I bought this product. The saddle height has risen, which made it easier to row. Even a bicycle shop in the town is a product that enters hands, but it is saved because the monotaro is far cheaper. I was looking for a long post so that adults can ride without stress under 24-inch bicycles. Adults are okay if it extends to quite the last minute, so children can also do it, of course, so OK I think whether it is a necessity rather than satisfaction or not. I bought a bicycle for children for remodeling for adults. Because it is stain-plating, it seems to be used without rusting, the sitting height has risen We are comfortable riding. Purchased for the purpose of replacing the current seat post rusted and damaged. I saw it for a new exchange and saw it for the first time that I exceeded the max line. Since the desired height can be secured even at a position not exceeding the max line, 300 mm is good. I sold it at a nearby home center, but I bought it to match the total amount of mail order. Because it is this price with stainless steel, it is COSPA highest. I used it to refresh the rusted seat post. Because it is stain it will not rust next. Customers also appreciate it. There is no problem in the function of supporting the seat, but it may be rusty. Sometimes the sea is close, but it got rusty in two months after purchase.